George Gissing’s 1893 novel takes on the 19th century “Woman Question” by looking at themes of feminism, marriage, and love. 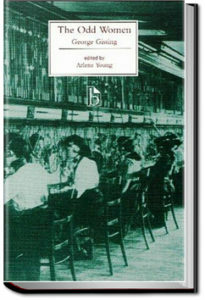 The novel raises these issues through the lives of several contrasting women: Mary Barfoot, a feminist philanthropist who helps train women for careers; her close friend Rhoda Nunn, who believes marriage is a disastrous choice for women; and Monica Madden, who starts out as one of their protegees but chooses to marry a seemingly kind older man. As Monica experiences the challenges of married life, Rhoda finds herself drawn to Mary’s cousin, the charming but apparently profligate Everard.